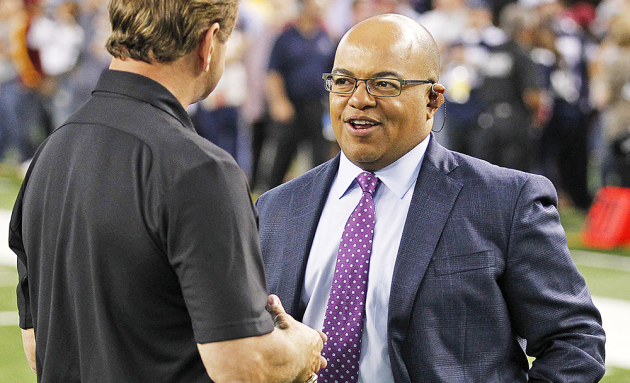 LOS ANGELES -- Mike Tirico is an all-star announcer for NBC's football coverage with a 2017-18 schedule that calls for him to cover nearly 30 games and host all the network's Sunday night games. But even though NBC has the rights for next year's Super Bowl, he won't be in Minneapolis for it. "The one game that we get every three years, that you can’t wait for, and I will be in Korea," Tirico said last week. It's not a long-planned family vacation that will take the sportcaster to Asia. He'll be the primetime host of the Winter Olympics in South Korea, taking over the Games for long-time staple, Bob Costas. It is the first time since 1992 that a network has had both the Winter Olympics and the Super Bowl in the same year. The Super Bowl takes place Feb. 4, four days before the start of the Winter Olympics, which run Feb. 8-25. "It is an unusual platform to get to promote the Olympics during the Super Bowl," said Jim Bell, executive producer for NBC's Olympic coverage. "We are still making our plans for that, but it’s safe to say that if you are watching the Super Bowl, you’ll know that the Olympics are coming up a few days later." Tirico admits that he'll miss not being at the NFL's biggest game, but he couldn't pass on the opportunity to quarterback the Winter Games. "As I tell my kids all the time, 'Life is a series of trade offs,' and I feel like I won on that trade," he said. So no truth to my theory that he's skipping Minneapolis to avoid the cold? "I live in Ann Arbor, Michigan. I went to college at Syracuse," he said. "So from all cold weather places come really nice people because we have to talk to each other all the time."